A must read: "Liberty and Tyranny"
Bond market vigilantes to the rescue? 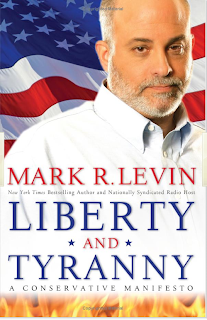 Yesterday I finished reading Mark Levin's new book, Liberty and Tyranny. It's excellent, and I think all citizens should read it. He does a tremendous job of putting the rise of Big Government into historical perspective, explaining why and how it has happened, and scaring the bejeesus out of all those, like me, who have been worrying about this for a long time. I thought things were pretty bad, but now I know they are a lot worse. I don't recall seeing anything in the book that I hadn't seen before, but the way he puts it all together (in only 200 pages) gives it new life and meaning. The book is crammed with facts and figures and hard logic. I'm pretty familiar with most of those facts and most of the arguments he makes, and with very few exceptions I don't think he has exaggerated or twisted anything. This is not a rant against big government, this is a very tightly argued case (he is a lawyer with lots of Washington experience) against Big Government, especially as practiced by President Obama. The book is all about how Conservatives (those who believe in the supremacy of individual liberty, private property, limited government and free markets) have lost the battle to Statists (those who believe in the supremacy of government). From the Constitution's vision of a strictly limited federal government we have now reached the point where Washington D.C. mandates how much water our toilets can use. I share virtually all of his beliefs (with the main exception being his views on immigration, which I think are overly xenophobic), since they are basically those of the libertarian party as best embodied (in my view) by the good folks at the Cato Institute. Libertarians are really what Republicans should be, and becoming more libertarian is the only way the Republican Party is going to have a chance to get back in the game. In that regard, it is notable that Levin never mentions abortion rights or gay marriage. He and I would probably agree that those two planks of the Republican platform have always stood out as contradictory to the basic principles of individual freedom and limited government. The Republicans need to strengthen their message of limited government, freedom, and free markets, and leave behind the religious-right baggage that has alienated those who consider themselves fiscal conservatives but social liberals. Republicans should realize that a limited government has no business telling people how to run their personal lives, just as Democrats should realize that giving government too much power will only end up enslaving us. This is all deadly serious stuff. HT: My son Ryan, who gave me the book. Here's an update of a chart I posted about a month ago. Spreads on Credit Default Swaps (a proxy for spreads on generic corporate bonds) have continued to narrow, although they still remain unusually high. With monetary policy still very accommodative (and verging on inflationary), and with lots of economic and financial fundamentals showing improvements, I expect we will see continued narrowing in these spreads. A pickup in inflation and a pickup (however modest) in the economy should go a long way to keeping default rates within reasonable limits. That makes the current double-digit yields on junk bond very attractive. Here's an update of a chart I posted about a month ago. See here for the post and a detailed description of the index. In short, the index measures the degree (in standard deviations) to which conditions in the equity, bond, and money markets are deviating from their long-term average. Things have improved dramatically from the low point at the end of October. I have long maintained that improvement in the financial market fundamentals was a necessary condition for an improvement in the physical economy. This is a good reason to remain optimistic that we have seen the worst of the crisis and also to believe that the economy is already on the mend. Very bullish. With each passing week that the assault against global capitalism continues in Washington, I become more nostalgic for one missing voice: Milton Friedman's. Imagine what the great economist would have to say about the U.S. Treasury owning and operating several car brands or managing the health-care industry. "Why not?" I can almost hear him ask cheerfully. "After all, they've done such a wonderful job delivering the mail." In the midst of this global depression, rotten ideas like trillion-dollar stimulus plans, nationalization of banks and confiscatory taxes on America's wealth producers are all the rage. Meanwhile, it is Milton Friedman and his principles of free trade, low tax rates and deregulation that are standing trial as the murderers of global prosperity. The myth that the stock-market collapse was due to a failure of Friedman's principles could hardly be more easily refuted. No one was more critical of the Bush spending and debt binge than Friedman. The massive run up in money and easy credit that facilitated the housing and credit bubbles was precisely the foolishness that Friedman spent a lifetime warning against. Milton's ideas on capitalism and freedom did more to liberate humankind from poverty than the New Deal, Great Society and Obama economic stimulus plans stacked on top of each other. But in the energy industry today we are trading in shovels for spoons. The Obama administration wants to power our society by spending three or four times more money to generate electricity using solar and wind power than it would cost to use coal or natural gas. The president says that this initiative will create "green jobs." I recently phoned Rose Friedman and asked her what she thought about the attacks on her husband. She was mostly dismayed at how far off-course our country has veered under President Obama. "Is this the death of Milton's ideas?" I hesitantly asked. "Oh no," she replied, "But it is the death of common sense." Here's another green shoot from the global economy. Japan's industrial production late last year collapsed along with global trade and commodity prices, but in the past two months it has turned up significantly. This confirms the signals from commodity prices, energy prices, container shipments and shipping rates: global trade has rebounded, and the global economy is on the mend. There is still a lot of mending to do, of course, but the important thing is that we have seen the worst. Confidence is being rebuilt, and activity and prices will most likely continue to improve. Loyal reader, reliable critic, and fellow libertarian Tom Burger recently brought to my attention an editorial published in the New York Times, in September 1913. "The editorial was reacting to a platform of Teddy Roosevelt that included an income tax, a central bank, and curbs on competition." The fact that it resonates so well with Obama's rhetoric of today convinced me to transcribe a portion of the text (the original at the link above appears to be a fuzzy scan). If you had any doubts about the socialist origins of Obama's beliefs, this should put them to rest. Theodore Roosevelt has now brought out and matured his doctrine of Socialism. It is not the Marxian Socialism. … Mr. Roosevelt achieves the redistribution of wealth in a simpler and easier way. He leaves the land, the mines, the factories, the railroads, the banks—all the instruments of production and exchange—in the hands of their individual owners, but of the profits of their operation he takes whatever share the people at any given time may choose to appropriate to the common use. … Mr. Roosevelt’s reconstitution of society would leave it inert by destroying individual initiative, hope, and ambition, which are the foundations of progress. … why has he constructed it? Because he knew that with his great skill he could make this Utopian dream attractive to that very considerable part of society which is the material with which agitators work—the discontented, the unsuccessful, the envious. And upon a Progressive Party thus assembled and fortified with delusions he would rise again to power. In the end, we are reminded that those who benefit disproportionately from a more powerful state are the political leaders themselves. And therein lies their motivation. Gold prices have been rising ever since the Fed started easing in early 2001. There have been ups and downs along the way, but the uptrend has remained largely intact for almost 8 years. Gold fell last year, as commodities did, but by only half as much as the decline experienced by most commodities. Gold turned up in November last year, about a month before commodities started to recover. Gold is now approaching its all-time of $1000; will commodities return to their previous highs? Will Fed ease have given us another commodity price bubble? Commodities have turned up meaningfully from their year-end lows, in direct definance of the theory that says that when economies are operating way below their potential (i.e., when "economic slack" is significant) then prices of everything tend to fall. It's popular to explain away the rise in commodity prices by asserting that China and India are mindlessly stockpiling commodities, and so this is just a temporary phenomenon. But when just about every single industrial commodity price is up, then I would argue that there must be some fundamental factors at work. Two things come quickly to mind: a rebound in global economic activity (bolstered by the big rise in shipping rates, the big upturn in outgoing container shipments, the big rise in global equity markets, the big drop in credit spreads), and very accommodative monetary policy (as seen in the extremely low level of nominal interest rates in all major economies and the very expansive growth in money supply measures). Zeroing in on the energy sector, crude oil prices are up about 85% from their December lows. Gasoline at the pump is up about 50% from the end of last year, and considering that its price lags that of crude, gasoline is probably going up another 20% over the next month, which in turn would bring regular gasoline back to around $3 per gallon at the pump. That's not enough to qualify as "expensive" in my view (I keep thinking that gas needs to be over $4 a gallon to really grab people's attention), nor to cause a consumer revolt or any major push to buy more fuel-efficient cars, but it is enough to put inflation back on the table. For TIPS fans, I would note that the rise in gasoline prices will contribute a little over 4 percentage points to the CPI for the January-August period, and that in turn would probably drive the total CPI adjustment for this year higher than the TIPS market is hoping for. If there are indeed two major forces pushing commodity prices higher (e.g., renewed economic growth and expansive monetary policy), then it is difficult at this point to say that the rise in commodity prices is the start of another bubble. (Bubbles being defined as prices that are pushed to unsustainable levels by speculative demand.) It's difficult if not impossible to say how much of the current rise in commodity prices is inflation/easy money speculation and how much is due to strong demand coming from a resurgent global economy. The continued rise in gold prices tells me that there is definitely an element of monetary-driven inflation at work. As I mentioned in my earlier posts this week, I think we have now passed a "tipping point." Fed policy has shifted from correctly accommodating a massive increase in money demand, to now oversupplying the world with dollars. This shift is not the result of anything the Fed has done; it is the result of a change in the world's demand for dollars and for liquidity. The worst part of the financial crisis has clearly passed, and so the world's demand for money is now declining; money velocity was declining but it is now increasing. The Fed needs to withdraw money from the system; if it doesn't, then the gold market will prove once again to be prescient, and an abundance of cheap dollars will cause inflation to rise and commodities will once against enter bubble territory. I believe Bernanke when he says that he is deeply committed to low inflation and a strong dollar. But for now I think the Fed is incapable of taking bold steps to tighten liquidity conditions. Unemployment is too high, and the political environment is too skewed towards "making sure" (Obama's favorite phrase) that the economy gets back on track whatever the cost. So that leaves me thinking that gold is right: inflation is going to be increasing, and commodity prices are going to continue to rise. Rising inflation and commodity bubbles are not good for the economy in the long run, because at some point the Fed will have to tighten the monetary screws and that will likely give us yet another recession. But for now, I think it pays to bet on rising real and nominal cash flows, and rising prices for "things." That means staying long equities, long TIPS, and short T-bonds. I would also be long commodities if it weren't for my real estate holdings. Full disclosure: I am long equities, long TIPS, and long TBT as of the time of this writing. New orders for capital goods—the seed corn of future productivity gains—have been flat so far this year. One good thing we could say is that, like unemployment claims, they haven't gotten worse. The free-fall last year was arrested by the end of the year, just as happened with commodity prices and high-yield bonds. Until we see some growth in this series, it will be tough to get excited about the economy's growth potential. Here's another way of looking at weekly unemployment claims: the 6-mo. annualized change in the four-week moving average. It's quite clear in this chart that the deterioration in the labor market has moderated signficantly. Looking at the weekly data in isolation tells the same story—claims have been flat since the end of January. Workers are still being laid off in relatively large numbers, but the pace of layoffs has not gotten worse over the past four months. I think it's safe to say the worst is behind us. I've been referencing the upturn in the Baltic shipping indices since early February, arguing that they were a good sign that the global economy was coming back to life. As these charts demonstrate, the rebound in the cost of shipping raw materials has now skyrocketed—the Baltic Dry Index is now up 377% from its December low. If this isn't a V-shaped recovery in global trade, I don't know what else to call it. Skeptics will say this only represents Chinese stockpiling of commodities, and that may indeed be a significant factor. But something is definitely going on out there. Where there's smoke there's fire. I really doubt that the Chinese are the only ones doing something with all the money that is floating around the world. I note that virtually all industrial commodity prices are up significantly so far this year, and oil prices are up 80%. U.S. consumers are paying 50% more for their gasoline since the end of last year, according to AAA. With the banking system now literally awash with liquidity (the U.S. monetary base, which is the part of the money supply that the Fed controls directly, has more than doubled—rising by almost $1 trillion—since last September), and with interest rates on cash less than 1%, it is only natural for people to try to shift some of that money into hard assets, thus pushing up their prices. And I think that helps explain why the equity market has been doing so well in the past few months. Furthermore, we've seen increasing signs that consumers are spending some of the money they hoarded in the final months of 2008; monetary velocity has turned up, and that means that the economy has likely turned up as well. Treasury yields are heading skyward, as the bond market begins to realize that a) the economy is improving, b) monetary policy is incredibly expansionary, and c) fiscal policy is creating massive financing needs. This is a perfect storm for the Treasury market, and it could send yields far higher in short order. These forces can easily overwhelm any Fed purchases of Treasuries, and the Fed is foolish if it thinks it can stop yields from rising, as I noted in a prior post. The silver lining to this thunderstorm cloud is that it may cause our politicians to rethink their plans to spend money like a drunken sailor. It would be great if Obama came to have the same respect for the bond market as Bill Clinton did. 10-year Treasury yields are the main drivers of fixed rate mortgage yields, and they have risen enough now to have marked a bottom in conforming fixed-rate mortgage yields. The spread between the red and blue lines on this chart reached an historical low of 68 bps the other day, and that was the limit to how far the spread could compress. It's now back out to 78 bps as 10-year Treasury yields continue their rise that began early this year. The low in 30-year fixed-rate conforming loan rates was thus 4.7%, and it occurred in early April. According to BanxQuote, rates are already up to 5% in some areas, and they will likely rise further. While the rise in rates may be disappointing to some, it is still the case that rates are incredibly low from an historical perspective. Plus, jumbo rates are likely to hold steady or even decline a bit, since the spread between conforming and jumbo rates is still unusually large. So this is not bad news for the housing market at all. Indeed, I would argue that this is very good news. The extreme low level of 10-year Treasury yields at the end of last year was the market's way of saying that the outlook for the economy was desperately awful. Now that the economy is beginning to recovery, yields need to rise to reflect the economy's improved growth potential (and perhaps also the increased risk of higher inflation). Higher yields are actually good for households in aggregate, since households have more floating rate assets (e.g., bank CDs) than floating rate debt (e.g., ARMs). And anyone who refinanced into an extremely low fixed rate mortgage in the past several months has now locked in a rate that might never be seen again. My good friend Russell Redenbaugh reminds me that rising mortgage rates should be good for housing, because it will force people off the fence who have been waiting for signs of a bottom in housing. Buy and borrow now, before prices and rates go higher; that's what we all learn to do in times of rising inflation. The Treasury yield curve has been as steep as it is today two other times in recent history. What's unusual about today's steepness is that, unlike the other occasions when the curve steepened, this one is being led not by a reduction in short-term interest rates but rather by a rise in long-term interest rates. Short-term rates have not changed much since the end of last year, but 10-year Treasury yields are up almost 150 bps. So this curve steepening is quite rare, since the bond market is the one leading the way, not the Fed. Most steepenings are driven by an easing of Fed policy (i.e., a lowering of short-term interest rates), typically in response to a weak economy. This reiterates the point of my earlier post: the bond market is signaling that the Fed has probably eased enough for now and should begin tightening, because inflation expectations have picked up significantly. Unless and until the Fed starts to reverse its massive liquidity injections, bond yields are likely to continue to move higher, and the yield curve is likely to experience an unprecedented steepness. We thus have the makings of a perfect Treasury storm here: long-term interest rates are being pushed higher as inflation expectations rise (fueled by easy money), and the pressure for higher rates will be intensified as Treasury embarks on the most massive bond sales by any measure since World War II. Full disclosure: I am short Treasuries via a long position in TBT and a 30-year fixed mortgage at the time of this writing. UPDATE: As my good friend Art Laffer keeps emphasizing, a steep yield curve is VERY good for banks, since they can borrow today at almost zero and lend along the curve at much higher rates. This is one reason that very steep yield curves almost always signal recovery. UPDATE II: I think the upshot of all this is that we've seen an important tipping point; from now on, every day that the Fed doesn't withdraw some of the trillion dollars it has injected, the odds of a significant increase in inflation increase. These charts focus on the market's inflation expectations, which are now almost back to "normal." The first chart is Barclay's calculation of the market's 5-year, 5-year forward inflation expectations, as derived from the difference between TIPS yields and Treasury yields. This is assumed to be the Fed's preferred measure of inflation expectations. The second chart shows the market's expectation for the average inflation rate over the next 10 years. Both charts show how expectations have almost returned to levels that might be considered "normal." The market is now expecting consumer price inflation to average about 2.5% for the foreseeable future. The message to the Fed is clear: it's time to start taking back all the money that has been injected into the banking system over the past 8 months. Deflation risk has all but vanished. The economy is getting back on its feet (see previous post on consumer confidence). Swap spreads are almost back to normal. Liquidity is returning to the bond market. Equity prices are improving. We've most likely seen the worst of the housing market. The yield on 10-year Treasuries is up to 3.46%, and is closing in on the 4% level which I would consider a good sign that the economy has achieved recovery mode. Will the Fed get the message? That is absolutely the key question for the months ahead. If they keep the pedal to the metal, their job (keeping inflation low) is going to be much tougher in the future. I think it is likely that they will be slow to react. That means that inflation risk is really coming to the fore. The gold market has been foreseeing this development for some time; in my estimation, today's $950 gold price assumes that we will have a meaningful increase in inflation in coming years. If gold moves higher, that will be a sign that the market is not only becoming quite confident in a rising inflation future, but also confident that the increase in inflation will be significant. The rebound in confidence in the past two months is an excellent sign that the economy has bottomed. Consumers are usually the last ones to figure out what is really going on. The message received by consumers so far is that the economy is going to avoid Armaggedon, but things still look awful. While I'm waiting for lunch to be ready, I thought I would post this update (with data through April '09) of a chart showing consumer loans at all commercial banks. Lending did drop by about $11 billion in April versus March, but as the chart shows, the growth of lending over the past year has still been above average. I think this chart still supports the theme I started last September, to the effect that it is not the case that banks have stopped lending or that there has been some sort of massive credit implosion. The Fed has taken extraordinary steps to ensure that money is plentiful. What has been lacking is confidence, and that is now returning. We do see some modest reduction in bank lending of late, but I think that is fully consistent with the obvious attempts being made all over the world to deleverage. People and corporations are paying down debt and saving more, and governments are picking up the slack. There is nothing sinister going on. The Drudge Report headline today: "Dollar Plunge; Fear over Debt." Lots of people worry that the possible downgrade of U.K. debt is just a forewarning of what will eventually happen to the U.S. as the Treasury prepares for an avalance of debt sales that could last for years. Not wanting to join immediately in the hysteria, I offer this chart as a way to begin to put things in perspective. The dollar is indeed weak, and it could get weaker, but in inflation-adjusted terms it's only about 5% below its long-term average. However, the dollar's true weakness is being masked these days because all major currencies are falling against objective benchmarks, the principal one being gold. All major central banks, with the possible exception of the Bank of Japan, have followed the Fed's lead and are pursuing very accommodative monetary policies in an effort to pull their economies out of the current recession/financial crisis. So it's not really a "dollar collapse" that is of concern, it's the potential for a revival of inflation around the globe. To be sure, the U.S. will be selling mountains of Treasury bills and bonds for as far as the eye can see. But that is not the source of inflation. What is potentially inflationary is the Fed's purchase of significant amounts of that debt, otherwise called debt monetization. When the Fed buys Treasury bonds it is equivalent to the Fed printing up some money and handing it to Treasury so that Treasury can pay the government's bills. This is how Argentina operated for many years, and after a long time (decades) it finally led to what might be called hyperinflation. We're a long way from something like that. When we see gold and other commodity prices rising, it tells us two things: one, global demand is reviving as the worst of the financial panic has passed; and two, everywhere, people and governments (e.g., China) are deciding that they don't need all the money they accumulated during the panic (otherwise referred to as a collapse in money velocity). By trying to unload their unwanted money balances they are pushing up the prices of things (otherwise referred to as rising money velocity). Money was something that people were desperate to acquire and hold onto; now it is becoming a sort of hot potato. It is getting passed around instead of sitting in bank accounts, and that is lifting prices. I imagine we are only in the early stages of this process. At some point central banks will see this and other signs of recovery and begin to withdraw the money they have injected into the global economy. Whether they do that in a timely fashion should be the real focus of everyone's attention. If they err on the side of caution, as seems likely, we will see inflation rise. The Fed is trying to fight a force of nature—the bond market—and they are bound to lose. Purchasing long-maturity Treasuries, mortgage-backed securities or corporate bonds in an atttempt to keep their yields low is a self-defeating strategy, since it at some point it will supply unwanted dollars to the world that will fuel inflation. 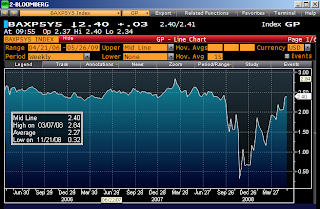 Ultimately, inflation and inflation expectations are what drive bond yields. If the Fed buys too many bonds, rising inflation expectations will kill the world's demand to own bonds, and yields will rise. It's that simple. So far this year, the yield on 10-year Treasuries has risen from 2.05% to 3.4%, and that is just a down payment on the eventual rise. Yields fell at the end of last year because the market came to believe that deflation and depression were highly likely to engulf the U.S. and global economies. Now we know that those dangers were vastly over-estimated. So yields couldn't remain at 2% or even 3%. If the U.S. economy is in the process of recovery, even tepid growth of 1-2% is not low enough to justify Treasury yields of 3% or lower. And if inflation manages to rise just a little above where it has been in the past several years—which shouldn't be too hard, given the Fed's massive monetary stimulus—that only adds fuel to the rising interest rate fire. As politicians should know (though they refuse to believe), the economy is not something that can be easily manipulated according to their whims or preferences. As the Fed should know (but amazingly they seem to ignore this), long-term interest rates are set by market forces, not by the Fed's Open Market Committee, whose only job is to attempt to control very short-term interest rates. Rising 10-year yields will put a floor under conforming mortgage rates, which have most likely already hit bottom. Yields on jumbo mortgages still have room to fall, however, as suggested by the second chart. Full disclosure: I am short Treasury bonds, via a fixed-rated mortgage and a long position in TBT. All politicians and all high school students (and anyone else who thinks that government can fine-tune economic growth) should be required to look at and think about this chart. What it demonstrates is that government "stimulus" plans which take money from one person and give it to another have absolutely no impact on the economy. The silver lining to the current economic cloud is that we are accumulating plenty of evidence, such as this, that Keynesian economics is not only devoid of logic but devoid of results. Can we now drive a stake through the heart of this miserable beast? (HT: Mark Perry.) I have to repeat part of his post if only to ensure that this bit of valuable wisdom is disseminated as widely as possible. The Economic Stimulus Act of 2008 passed in February. The major part of this package was to send cash totaling over $100 billion to individuals and families in the United States so they would have more to spend and thus jump-start consumption and the economy. Most of the checks were sent in May, June, and July. As would be predicted by the permanent income theory of consumption, people spent little if anything of the temporary rebate, and consumption was not jump-started as had been hoped. 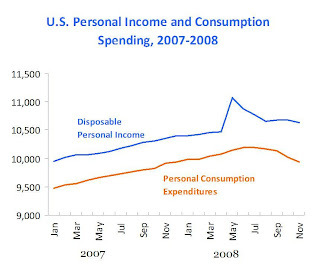 ... formal statistical work shows that the rebates had no statistically significant increase in consumption. 1) Have no net benefit to society in terms of costs and benefits. 2) Result in the loss of almost 50,000 auto manufacturing jobs in the U.S. over the next 5 years. 3) Have a "trivial effect" on global climate change: by the end of this century the proposal would a) reduce atmospheric CO2 concentration by 0.2%, b) reduce global mean surface temperatures by 0.007º C., and c) reduce sea-level rise by 0.6 mm. I would add that the projected benefits of the NHTSA analysis are so small as to fall well within the range of modelling error. And that's not to mention the fact that no one has yet developed a climate change model that can produced reliable results anyway. I would also note that if automakers are successful in producing such fuel-efficient cars, then U.S. oil consumption will likely decline, and that could well lead to lower oil prices, cheaper gasoline, greater oil consumption in countries that do not impose such standards, and more miles driven in the U.S. At the very least, reduced gasoline consumption in the U.S. would free up oil to be burned in other countries with less efficient cars and trucks. As a result, the future impact on global climate could actually be zero or even the opposite of what is intended. Why are we letting some egomaniac force such dramatic change on our economy, our lifestyles, and our freedoms, if there is no demonstrated benefit to anyone? Where is the outrage??? The folks at Markit have some nifty but relatively arcane indices that track the performance of various asset-backed and mortgage-backed securities. The first chart here shows the price of a representative sampling of home equity-backed securities initially rated AAA, while the second chart shows a sampling of commercial mortgage-backed securities rated AAA. Note how the prices of these securities—issued typically at a price of 100—had absolutely cratered around the same time that the stock market hit its lows in March. In just the past month or so these securities have experienced a significant rally, presumably because the market has sharply revised downwards its expectations of defaults. This is highly significant, and I can't imagine how these price reversals could be attributed to anything other than a) the return of confidence, and b) improving prospects for economic growth and incomes. It's particularly reassuring that, despite all the talk about a developing bust in the commerical real estate market, securities that are directly tied to the health of that same market have experienced significant price gains across the board. Bears will note that even with the recent price gains, these securities still reflect the expectation that default rates will be much higher than normal in both markets; that things now look very bad whereas before they looked positively dreadful. Optimists will counter that there has been significant improvement on the margin, that the likelihood of the economy falling down a black hole has declined dramatically, and that confidence is returning. At the end of last year the bond market was expecting to see roughly five years of deflation, followed by 5 years of modest inflation, adding up to almost a zero net change in the price level over the subsequent 10 years. Just five months later, the bond market now expects inflation to average about 1.1% a year for the next 5 years, and 1.7% a year for the next 10 years. While this marks a pretty dramatic shift in expectations, the inflation discounted by bond prices today is still lower than it has been for the past 5 years, and lower than the inflation registered in any 10-year period since 1965. The second chart shows the level of real yields on TIPS, and suggests that at today's prices TIPS are fairly valued. I would not expect to see real yields decline much further, even if inflation expectations continued to rise, because I think that higher inflation expectations will be expressed primarily in rising nominal yields on Treasuries. If I'm correct, then the buyer of TIPS should not expect to see their price rise by very much, if at all; the benefits to owning TIPS will be realized primarily by a rising income stream if inflation proves to be higher than the market now expects. I would be the first one to caution that rising inflation is not a good thing, but what we have seen so far this year—deflation expectations being replaced by modest inflation expectations—is a good thing I think. Reasonable men could argue about whether deflation is worse than inflation, but I think most would agree with me that it is better to have 1.7% inflation going forward than it is to have five years of deflation. That's particularly important these days, in view of the debt burdens that are weighing on so many people. Deflation compounds those burdens, since it makes acquiring the dollars to pay the debt harder, and it erodes the value of the assets and income streams that collateralize the debt. Note that I'm not trying to argue that more inflation is going to result in more economic growth. Indeed, I think that the past decade of erratic monetary policy has contributed significantly to reduce the prospects for U.S. growth. A return to higher inflation means the return of speculation (of which there are already some hints in the commodities markets), and that runs contrary to the investment that is needed to produce lasting gains in productivity, which in turn is the only thing that can give us rising living standards. For now, it's best to focus on the positives that accompany vanishing deflation risk. Worrying about the consequences of rising inflation is a task for another day. On that latter score, I would note the recent weakness in the dollar and the renewed upturn in gold prices, coupled with ongoing gains in commodity prices and a steeper yield curve. These are all portents of rising inflation pressures. Whether the Fed acts in a timely fashion to offset these pressures is going to be very important to how strong the recovery is going to be. If the Fed stays too easy for too long we will see a return of asset price bubbles and growth will be tepid. If the Fed tightens as necessary, confidence in the future will be strong and confidence in the dollar will contribute to a healthy investment climate, and that in turn will underwrite a bright future for the U.S. economy. Bottom line: vanishing deflation risk brightens the outlook appreciably, but rising inflation risk means we shouldn't get overly excited just yet. Full disclosure: I am long TIP and TIPS, and short T-bonds (via a long position in TBT), at the time of this writing. I first highlighted the Baltic shipping rate indices in early February, arguing that they were an early sign of a global recovery. That shipping rates continue to firm—the Baltic Dry Index has quadrupled since its low of last November—is an excellent sign that the global economy is on the mend. This is a green shoot that is very hard for the bears to ignore. The TED spread is now down to 54 basis points, only modestly above its median level over the past 20 years of 38 bps. Almost all of the decline has come from a reduction in Libor, which reflects a tremendous increase in banks' confidence in each other. TARP and liquidity injections have undoubtedly been a major factor behind the improvement, but it is also clear that many banks are once again profitable in their own right, and a goodly number are very interested in paying back their TARP funds in order to escape the government controls that came with them. If there is anything good to say about the TARP program it is that it has taught the banking industry an important lesson: government assistance comes with big strings attached. Ask for it at your peril. I've been posting updated versions of this chart since early November, arguing that since fear of a financial market meltdown was one of the causes of this crisis, then a reduction in fear and a return of confidence would be essential for a market recovery. As this chart shows, fear (using the Vix index as a proxy) has fallen to almost "normal" levels, and the market has been rising. Equity prices are obviously lagging the improvement in confidence, but I still see an awful lot of doomsayers out there saying that this is a sucker's rally. In any event, we now see swap spreads almost back to normal, and equity market volatility almost back to normal. Bond market volatility is still on the high side, but much less than it was late last year. 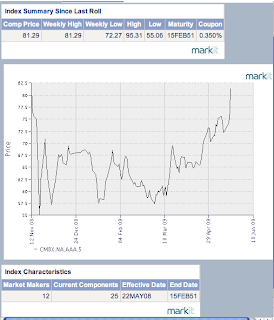 Commodity prices are up pretty much across the board. Real estate markets appear to be bottoming. Confidence is returning. This sure looks to me like it has all the makings of a recovery. Here's an update to a chart I posted a month ago. To be honest, the improvement in trade is not what I had expected. Outbound container shipments at both ports did not reflect any significant gains or losses in April. Similarly, the GDP statistics did not reflect any significant rise in goods exports for March, as I had expected would happen. This is not necessarily bearish, however. As the chart shows, there is no sign of any deterioration in exports, and every reason to expect that they have bottomed and are likely to rise in coming months. 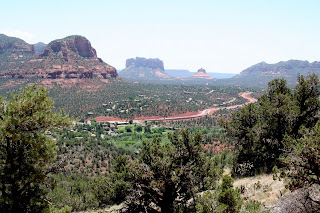 Wherever you drive in Sedona you are greeted by amazing vistas such as this. It's an enchanting area in more ways than one. I had no idea how big and spectacular the views were. The hiking is fantastic. Every hike we did turned out better than the one we had just finished. It would take a few weeks to do all the hikes. 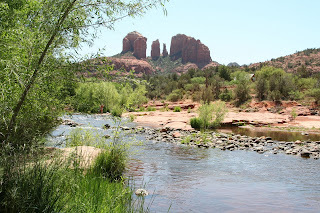 Think of Sedona as a vast bowl studded with magnificent rocks jutting skyward. There's a place in the middle, which also serves as the Sedona airport, called Airport Mesa. There's a hike that goes most of the way around the mesa and offers spectacular views of the whole area, and it's called "Airport Loop." It shows up in the maps they give you, but nowhere did I see anyone say it was such a fantastic hike. Here's my version of what is supposedly one of the most photographed spots in the U.S. We sort of stumbled upon this view of Cathedral Rock by accident, and then magically ended up at the site of one of the Vortexes that have psychic powers. I took this somewhat incongruous shot a few blocks from where we were staying. 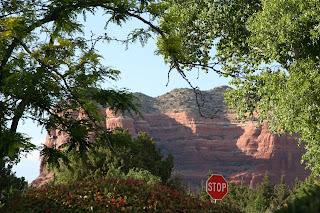 No matter where you go in Sedona you are surrounded by magnificent scenery. Even when you are approaching as Stop sign. In response to some recent questions, here is a short summary of what swap spreads are. You can also find stuff on wikipedia. I follow swaps spreads via Bloomberg, but unfortunately they are not readily available to the general public. Swaps are transactions that allow people to redistribute risk. They are over the counter agreements between any two parties to exchange one cash flow for another. The most basic swap is fixed rate for floating rate payments. If I own bonds (fixed rate instruments) but I worry about the prospect of interest rates rising, I might want to reduce my fixed rate exposure by entering into a swap with someone else; I would pay him the fixed rate I receive on my bonds and he would pay me a floating rate, typically Libor. I reduce my risk that way, and he increases his. He also becomes exposed to the risk that if interest rates fall, I might renege on my promise to pay him a fixed rate and he might lose out on the profit inherent in his position. In order to compensate him for these risks I need to pay him the fixed rate plus a little extra, which is the swap spread: the difference between the rate I am paying him and the rate on a Treasury bond with a maturity equal to the term of the swap agreement. So swap spreads are a lot like credit spreads since there is counterparty risk involved. Swaps have mechanisms such as collateral agreements to minimize counterparty risk, and so can be thought of as equivalent to the spread on a AA-rated bank bond. Swap spreads are also a barometer of risk aversion in the marketplace. The more people want to swap out of their risky exposures, the more they must be willing to pay to induce others to accept that risk. So rising swap spreads equate to more risk aversion. Swap spreads can be thought of as barometers of systemic risk for the same reason. Swaps are extremely liquid markets (much more liquid than the corporate bond market, where everything is quoted on a spread to Treasuries basis) and represent a key mechanism for the transfer and/or redistribution of risk among large institutional investors. They help make markets efficient. When they all but shut down, as they did in September, that is a sign that liquidity has dried up because a) everyone wants to reduce risk, and b) everyone is terrified of entering into any transactions because they are unable to quantify the risks out there. Swap spreads during normal times and normal markets typically trade in the range of 30-40 basis points. There are swap markets for all sorts of thing: interest rate swaps, credit default swaps, index swaps, currency swaps, etc. Swaps are agreements between two parties to exchange cash flows. In a typical swap, A pays a fixed rate of interest to B, and B pays a floating rate (Libor) to A. A also needs to pay B a spread above the fixed rate to compensate him for the increased risk he takes on. Swap spreads are thus an indicator of how willing people are to transact with each other, how much it costs to reduce your risk, and how liquid the market is. Swap spreads can also be thought of as representing the riskiness of a generic AA rated bank--the higher the spread the more risky banks are perceived to be. The swaps market is huge but generally restricted to large institutional investors and broker-dealers. 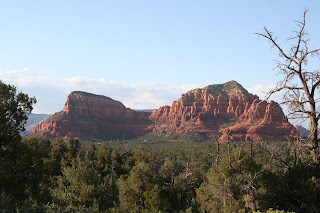 I'm off for a car trip to Sedona, AZ for the next several days. I've never been there before, and I haven't taken a long car trip in decades, so this should be fun. Blogging may be a little light as a result. I'll post some pictures for sure. One headline I saw reported that today's CPI release showed that deflation risks were pretty low. I think it confirmed that inflation is still very much with us. The headline, year over year number will be negative for the next several months, due to rising energy prices a year ago. But it should return to positive territory before the end of the year, especially now that energy prices are rising again. Excluding food and energy, prices were up 1.9% from a year ago. Considering how weak the economy is, and the enormous amount of "slack," or idle resources, that it has, believers in the Phillips Curve must be scratching their heads, wondering why all measures of inflation are not in negative territory. Inflation is still alive and well, and it is likely to be picking up over the course of the next 6-12 months, thanks to accommodative monetary policy. This will be very bad for Treasuries, and good for TIPS, because the bond market is still convinced that inflation is going to be very low for a very long time. Full disclosure: I am long TIPS and TIP, as of this writing. Swap spreads have accurately forecast conditions in the economy and in the financial markets. They started rising in 2007, well before the financial storm of 2008 hit. 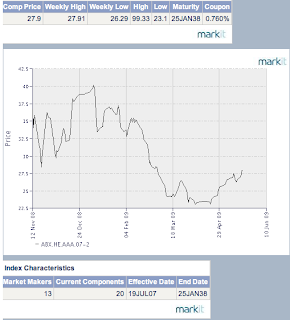 They peaked in early October '08, months before the bottom in equity prices in early March '09. They have now returned almost to what might be considered normal. Meanwhile, the debate over the current state of the economy rages, with some (including moi) arguing we've seen the worst and the economy is on the mend, and others arguing that the worst is yet to come. I think this dramatic improvement in swap spreads is really significant. It reflects the return of liquidity to the bond market; the return of confidence in counterparty risk; the return of an appetite for risk; and a significant reduction in uncertainty. The Vix index, a measure of fear and uncertainty in the equity market, is also almost back to normal. These developments are essential in order for the economy to recovery from last year's crisis, since the crisis arose basically from a crisis of confidence in the banking system. Well, it seems the Fed and I see things the same way. In a Bloomberg article today, I read that "The Federal Reserve considers the recent jump in Treasury yields more as a reflection of a better economic outlook than a signal it needs to step up purchases of U.S. government debt." Fed policy makers committed to buy as much as $300 billion of Treasuries over a six-month period in their March 18 Open Market Committee statement. The aim was “to help improve conditions in private credit markets,” the FOMC said. In short, the Fed would buy Treasuries not to keep Treasury yields low, but to supply liquidity to the market. If the economy improves, and that sure looks to be the case, then higher Treasury yields would be a very positive sign and the Fed would be delighted, not concerned. This is a very bullish development, since it reduces the risk of inflation. If the Fed tried to keep Treasury yields from rising in an improving economy, it would almost surely fuel unwanted inflation. This is also another good reason to avoid investing in Treasuries, unless you are pretty sure or very afraid that the global economy is going to collapse: The Fed is not going to try to support the Treasury bond market. And they really couldn't, even if they tried, because it is so big. Full disclosure: I am long TBT (and thus short Treasuries) at the time of this writing. My comment about the "sometimes-circular logic" of the bond market was not an endorsement of the way the bond market thinks. In earlier posts I've made it clear that I think the bond market is underestimating the risk of higher inflation. One reason for that is that both the bond market and the Fed believe that inflation is largely a function of the strength or weakness of the economy. Call it the Phillips Curve theory of inflation. As a supply-sider and as a monetarist, I believe that inflation is a monetary phenomenon. I think low inflation is conducive to stronger growth, whereas the Phillips Curvers believe that stronger growth is conducive to higher inflation. The belief in the argument that growth causes inflation is based on the observation that inflation tends to decline in the wake of a recession. Correlation is not causation, however. Every one of the post-war recessions that we've had have been the result of a significant tightening of monetary policy. (See my posts on the real Fed funds rate and the slope of the yield curve.) So the real cause of declining inflation has always been tight money, not weak growth. I've been pointing out for months now that despite the economy having hit a major air pocket, there has been no noticeable decline in core inflation. This contradicts the expectations of the Phillips Curvers, and supports the logic of the monetarists. Furthermore, collapsing energy prices have been the major factor depressing inflation to date, and now energy prices are rising again. As for taxes, the market is correct to assume that higher taxes to fund Obama's expansion of government will tend to weaken the economy. But that doesn't mean that inflation is going to be low forever, as the bond market currently assumes. The inflation threat is independent of the course of taxes. Of course, it's possible that the Fed could try to soften the blow of higher taxes by keeping monetary policy accommodative, but that would only increase the eventual inflation problem. Finally, I've mentioned before that I don't think higher Treasury yields are necessarily a threat to the economy. Higher Treasury yields will be a good sign that the economy is improving. The economy has thrived for years during periods of rising interest rates. Treasury yields are so low now that they could rise hugely before they posed a threat to the economy. We would need to see a monumental increase in the real Fed funds rate (which is currently negative) and a major flattening of the yield curve (which is now very positively-sloped) before higher interest rates would pose a threat to growth. Retail sales fell modestly in April, but they were higher than in December. The big story here is not the month to month changes, but the fact that the free-fall in sales which began last August has almost certainly ended. This is what a bottoming process should look like. The things to watch for signs of a recovery are the things that trade in real-time. That's where the action is, and there are no lags in the data to worry about, no faulty seasonal adjustment factors, etc. On that score, industrial spot commodity prices are up 15% from their December lows, industrial metals prices are up 30% from year end, petroleum products are up almost 40% from year end, and shipping rates are up 180% from year end. According to the AAA, nationwide average prices for regular and premium unleaded gasoline at the pump are up 10% so far this month. And of course equity prices are up by one-third from their lows in early March. To me, the bulk of the evidence weighs in favor of an economy that is slowly recovering. Treasury today released April data on federal government revenues and outlays. The deficit in the past 12 months now totals $1.25 trillion, and as the second chart shows, revenues are collapsing while spending is soaring. Let's be optimistic and assume the economy is already beginning to grow again, but it's hard to see a recovery in revenues that is much stronger than what we saw coming out of the 2001 recession. What was then the "jobless recovery" is going to be replaced by a recovery that has to climb a wall of higher taxes. That means that revenues probably won't turn up meaningfully for another couple of years. Meanwhile, we know that spending is on track to reach $4 trillion next year. The amount of debt that will need to be sold over the next few years is thus absolutely staggering. It hasn't upset the bond market much, however, because there is still a lot of fear of the future out there, and bond investors are willing to accept meager yields on Treasuries because they are concerned that the alternatives—corporate bonds—will suffer from very high default rates because the economy will remain weak. In the sometimes-circular logic of the bond market, then, the prospect of massive Treasury supply is being ignored as a threat because that same supply will bring with it a massive increase in taxes, which will in turn keep the economy weak for the foreseeable future, which will in turn keep inflation low. Another installment in this series. I first highlighted the narrowing of swap spreads back in late October/early November, and predicted that this was an important precursor of an improvement in other markets such as high-yield bonds and equities. Swap spreads are proving once again to be a great leading indicator of the health of the financial market and the economy. And the story is still playing out, as swap spreads continue to fall and are beginning to approach levels that might be considered "normal." Lower swap spreads say that high-yield debt and emerging market debt should continue to rally. Full disclosure: I am long HYG and EMD as of the time of this writing. With few exceptions (e.g., wheat, corn, cattle), commodity prices have risen significantly this year. I think this reflects a fundamental improvement in the global economic outlook. Demand collapsed briefly in the fourth quarter of last year as the banking crisis sowed general panic, but it has now firmed and is likely picking up as economic life slowly returns to normal. It also reflects, as is strongly suggested by gold prices, that monetary policy is quite accommodative. Money is plentiful, and as demand and confidence returns, we are seeing some renewed interest in commodity speculation and stockpiling. The rise in commodity prices is thus a reflection of renewed economic growth, as well as a precursor of higher inflation. Gasoline prices at the pump have jumped almost 10% this month, and since gasoline is about 5% of the CPI, that alone could give the CPI a boost of 0.5%. I think it is very hard, in the face of this price action, for the Fed to argue that policy needs to be super-accommodative for a prolonged period in order to ensure that the economy avoids deflation and/or depression. If the Fed were following a commodity standard, they would already be taking steps to withdraw the liquidity they have injected in the past 6-8 months. By ignoring the signal of market-driven prices, and instead worrying about the supposed fragility of the recovery, they are making yet another monetary mistake. For many years I used this chart to show that the relationship between federal debt outstanding and interest rates was exactly the opposite of what most people tend to think: the two have been for the most part (with the notable exception being the 1990s) inversely correlated for many decades. That relationship may now be on the verge of changing: the big increase in federal debt that is slated for coming years will likely correspond to rising interest rates. The reason? Debt is going to be increasing much faster than GDP for years to come, and the Fed is making huge purchases of Treasury debt, thus monetizing the debt as never before. Rising interest rates are thus likely to be driven by a) an avalanche of Treasury supply and b) rising inflation. These are going to be the critical issues to focus on in coming years. I don't think they mean that the economy will collapse. Instead, I think it is a good reason to expect that economic growth will be subpar (averaging less than 3%) for many years. As this Gallup poll shows, the majority of people worry more and more about the threat to the country that bigger government represents. 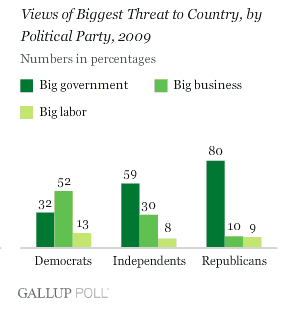 And as this shows, Democrats today are relatively unconcerned about big government, fearing big business more. Republicans are the ones most concerned about big government, and if that proves to be the party's rallying cry in the years ahead, there will be plenty of grist for the mill. A primary thrust of the American political tradition is a fear of centralized government with too much power. And the U.S. capitalist economic system has given businesses wide latitude to operate with minimal government interference. But those values were put to the test last year as the imminent collapse of several major U.S. corporations threatened to drive the country into an economic depression. The government responded by infusing some of these failing companies with cash and in some cases taking on significant ownership in the companies.